Football. Futbol. Voetbal. Futebol. Fußball. Fotboll. Calcio, Soccer. Many languages, one big passion. Soccer: The world’s most popular sport and the number 1 sport played all around the globe. No matter your religion, ethnicity, color; if you’re rich, poor, a boy or a girl, soccer unites people. It is a different, unique and magical game. Are you ready for the most fr tournament in Vancouver? 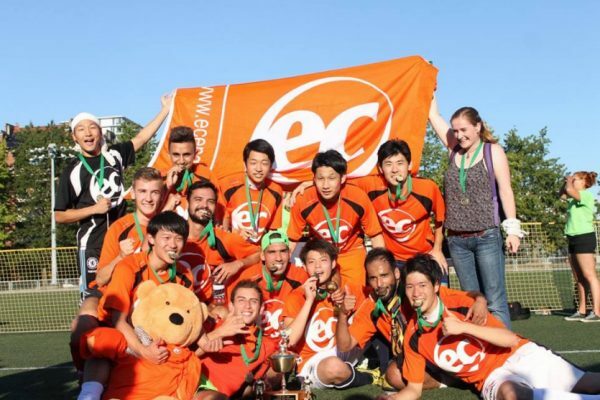 Every year 16 English schools in Vancouver are selected to play for the Club ESL Soccer Cup. The league will be made up of two divisions, and league play will run for 11 weeks to determine each team’s seed within their respective division. Teams will then compete in a knockout tournament for the Club ESL Cup to be awarded on August 24th. Each team is guaranteed to play a minimum of 8 games and up to a maximum of 11 games. Get your gear ready and join the EC Vancouver Team! Planning to come to Co improve your English skills? Find out more about TOEFL Courses in Vancouver!